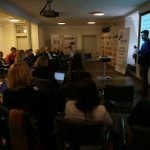 A survey conducted by Bialystok University of Technology as part of GoSmart BSR project shows that entrepreneurs, when asked about development barriers, point to the lack of capital in the first place. It is known that lack of knowledge is often an unconscious barrier to expand beyond the domestic market. However, ‘know-how’ can also be considered a ‘capital’ that often serves as an idea to overcome the financial barrier. The mushroom producers from the vicinity of the city of Siedlce in the East of Poland had a great idea on how to acquire foreign markets. A group of 20 mushroom producers established a cooperative, connecting people, aggregating resources and capital in economic units that overcome barriers for development. The cooperative business model fosters joint action and the ability to influence the management and economic autonomy of members. Democratic management according to the principle 1 person equals 1 vote allows everyone to contribute to the common interest. The “Pieczarka Siedlecka” cooperative was established at the beginning of 2007, specializing in the production of high-quality mushrooms: white champignon (agaricus campestris) and brown champignon, called royal. Their activity also includes buying and selling mushrooms on the domestic market to the supermarket chains, processing plants and companies from the catering industry. However, great number of mushrooms are exported to many European countries. Siedlce mushrooms are valued for their rich taste and aroma, among others, by customers from the United Kingdom, France, Russia, the Netherlands, Belgium, Bulgaria and Italy. The direct impulse for the emergence of the cooperative was the growing quality and price competition in this industry, as well as the willingness to bypass intermediaries and establishing direct contacts with the recipients. The supply capabilities of the producer group are growing steadily thanks to expanding mushroom growing area, investments in modern technological solutions, cooperation with the best substrate producers and acquiring new members. Implementation and certification of the GLOBALG.A.P system allowed to standardize production and increase the quality of mushrooms. Quality supervision is exercised by an independent organization possessing the necessary certificates and permits for sampling mushrooms and substrate, and issuing certificates recognized in Poland and in the European Union. Thanks to that Siedlce mushrooms are safe for health, ecological, tasty and healthy. Currently, Poland is a world leader in the quality of mushrooms produced and largest producer in Europe and one of the largest in the world. Most Polish mushrooms are produced on the EU market and other European countries. Mainly fresh, but also processed and frozen mushrooms are exported. The number of companies involved in this branch of business is constantly growing. Producers have an opportunity to exchange their experiences at the largest specialised trade fair in Siedlce, Poland – Pieczarkalia, which is gradually becoming an international event. The trade fair gathers global leaders of all segments of mushroom business: composting plants, mycelium producers, coverings, disinfectants and protective means, and many others. In 2018 representatives of mushroom industry organised a conference where, in addition to the economic and technological aspects of mushroom growing, for example: Heat pumps – a small change in large possibilities or Innovative system of harvesting mushrooms and increasing productivity, there were also lectures on business management methods. Mushroom Business magazine wrote about the Mushroom Fair emphasizing influence of the Netherlands as one of the countries Poland learned most from during its history of mushroom growing. Learning from others, exchange of experience and further improvement of business are just a few benefits that internationalisation offers. Article created by Krystyna Zimnoch, PhD.